Here is the good news for all Android users, now the Paranoid Android is back in full force. The ROM comes with lots of customization and feature which others rom don’t have. Now, the Paranoid team is back with a new team of developers and a new operating system based on Android 6.0 Marshmallow. And the ROM is available for most of the Nexus and OnePlus phones. The ROM is packed with lots fo new features like the custom Quick Settings, floating windows support for all apps, support for the CM Theme Engine, etc. Like most custom ROMs you need to install Gapps zip packed with the ROM to use Play Store and other apps including Google Maps, Gmail, and YouTube. Here in this tutorial, we are showing you how to install Paranoid Android 6.0 on Nexus and Oneplus phones. This guide will work on all the Nexus phones and Oneplus phone. All you needed a phone with TWRP or CWM recovery to flash the latest build of Paranoid Android 6.0 on your phone. Lets us take a look how to do that and enjoy the new ROM on the phone. a) Nexus and Oneplus with Unlocked bootloader and Recovery. b) Nandroid Backup, if something goes wrong during the installation, then you can quickly restore the previous version of ROM on your phone. 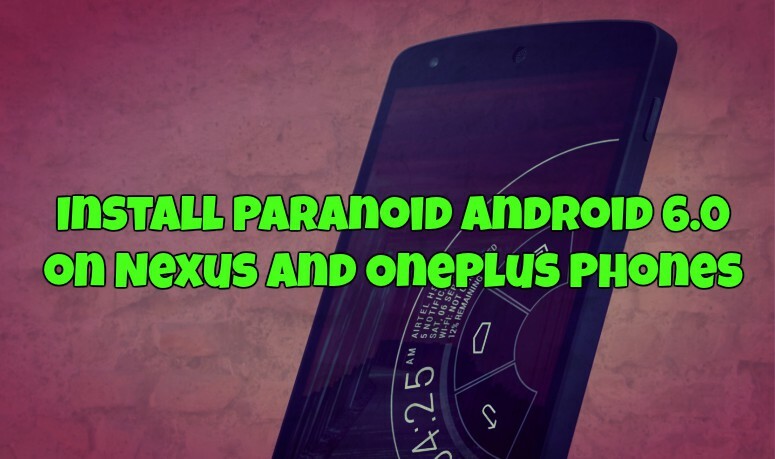 c) Paranoid Android 6.0 ROM for Nexus and Oneplus. Download the Paranoid Android 6.0 ROM here. d) Latest Gapps zip file to install all the Google applications on the ROM. Download Gapps here. Step 1. Once the Paranoid Android 6.0 ROM and Gapps File are downloaded. (Download Form the Above mention links). Move both the zip files on your internal phone memory and remember the location. Step 2. Now boot your Nexus and Oneplus in Recovery mode. Step 3. Once your phone in recovery mode. Go to Wipe and Wipe Cache and Data from the phone. Don’t wipe the Interna; SD card or memory, otherwise you will lose the zip files that you saved on the phone. Step 4. Now go back to the main menu of the Phone and select Install and browse for the ROM zip file and Flash it. Step 5. Once the Paranoid Android 6.0 is installed, Go back and install the Gapps zip file to install the Google application on your phone. Step 6. Now come back to the main menu and Select Reboot system. Now your phone will reboot, and the first boot will take some time near about 3 to 5 minutes. That’s it! Now your Oneplus and Nexus phone is running on the latest build of Paranoid Android 6.0 Custom ROM. One question tho, Am I gonna lose root access when I install this ROM ? If yes how can I get it back ? Does this need a rooted phone?